One Client's Journey #10--Zero to 50 in 18 months! This month's newsletter is a spotlight on how one of my clients is achieving excellent success. I will not reveal her name, but trust me, she is real and so are her triumphs and challenges. It is my hope that her story will inspire you on to your own success as well. So, here is her story in her own words. Enjoy! Choosing to change my lifestyle to include hiring a trainer, cardio routines, and strength training has been the best decision that I’ve made in about 10 years! The hard part’s been staying on track for over 1½ years to lose 50 pounds. My weight has gone down slowly because I am trying to make fitness a lifelong commitment and not a quick fix to losing weight. Linda Burke, personal trainer, contributes to my journey with her personalized weight training workouts and nutrition plan. Currently, Linda plans my workouts through her online personal training. Each week she plans my weight training routine with my lifelong goals in mind. Weighing in on my first day with Linda was a shock to me to see the scales go over 220 pounds. She simply said, “It’s a number that will go down. Now, let’s get some measurements and start your fitness plan.” She was matter of fact in explaining to me that if I follow her plan and do the work, my body will change. Now, 18 months later I know that her plan works and it is up to me to decide what goes into my body and how much I am willing to follow her fitness plan. The things that worked for me over the past 18 months may benefit you as you try to make weight training, cardio and nutrition a part of your daily life. I knew that my eating habits had to change the more times that I worked out with Linda. I could not have positive results if I continued to stop at McDonalds for breakfast and pizza for dinner. Reading labels became a priority for me, which lead to fixing more meals at home. Again, Linda has helped with this through emails, her website at straightforwardfitness.com, and the nutrition plan and her online personal training. She talks to me about making this a choice for life and not stressing the small stuff or quitting when I do cheat or eat too much. Next, I knew for myself that this lifestyle change had to be fun and rewarding. Thus, I made my first reward a new lunch bag to pack my healthy food for the day. Sometimes I still slip and order a pizza or eat too much, but I know the next day I have to work that much harder. I refuse to let the scale climb back up to over 200 pounds, so I have to make a choice each day to eat the right foods. I rewarded myself with new shorts, cool socks, and shoes. I bought an exciting new athletic watch that records splits, has a timer and just looks the part of being healthy. This worked for me as Linda introduced me into interval training. She called it HIT training to get my body to jump-start its metabolism and to get my heart rate up to increase the weight loss. I also drink green tea in place of diet drinks. Green tea is great hot or cold, just brew it yourself and don’t buy the ready made sweet stuff. I also purchased an agility ball. Lastly, I now have subscriptions to 2 health and fitness related magazines. I am finally back to thinking about my body and how I want to continue to be an athlete and not look like a 40-year-old slob. Fitness and healthy food magazines also have great recipe ideas that are fun to try. Don’t buy into magic fixes, like Linda has mentioned in past newsletters. Instead, buy a cool watch or fun workout clothes and look the part when you are sweating in the gym! READ LABELS, PLAN AHEAD, & BE READY FOR THE LONG HAUL! Linda’s taught me to read labels. I started cooking at home, drinking more water and spending time on me. Healthy fat grams, high protein, high fiber, low calorie and healthy carbs have to be priority. She helps me to choose the right combination of nutrients to fit my body type. She told me about good fats verses harmful fats, and healthy choices such as wraps, grilled chicken, squash, salmon, 95-98% fat free turkey, spaghetti squash and a lot of food combinations that make a great tasting meal. I even tried the Ziploc bag pump for storing and freezing food. It is great! Just marinate and grill boneless and skinless chicken, let cool and put into the Ziploc bag, pump out the air and freeze it. It can be used anytime for a quick meal. Your body will change even after the first week if you follow a set plan. I noticed a change in my energy level and the ability to add 5, 10, 15 minutes to my cardio. My mental health changed as blood pressure and cholesterol went down as the number on the scales went down just like Linda predicted it would do on my first day. This is hard for me to write about as I had a great body and was very athletic until about 10 years ago when I gave up hope of ever being fit and healthy again. Deciding to try Linda’s plan was easy. The difficult part is staying motivated to make this a lifelong commitment and not expecting results to magically happen when I get on the scale. Daily, I remind myself that in order to reach my goal weight I must choose the correct foods, weight train and do the cardio. It helps knowing that I have Linda planning my workouts, and she’s just an email away with guidelines for nutrition and tips of the trade for weight training. Yet, like she told me before, "I can plan your workouts. It is up to you to do the work." I hope you enjoyed that. The best part is there is 50 pounds less of this person today than there was a year-and-a-half ago. I may have helped, but she did all the hard work. Congratulations, sister, and thanks for sharing! Your success and happiness is the best reward for both of us! 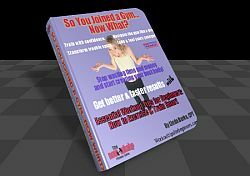 UPDATE: The eBook version of my book "SO YOU JOINED A GYM...NOW WHAT?" should be released in a few days. Yay! Just finishing some last minute details. Phew! What a project! Still diligently working on things and hope to have the hard copy version out in a couple of weeks. This is the part of the newsletter where I picture an exercise and give explicit instructions on its proper execution. This month’s exercise is one that will help you achieve that ever elusive and oh so sought after six pack. It's called the Swiss Ball Cable Crunch. It is an excellent exercise and one of my favorites, but approach with caution. It's advanced. Careful not to kiss the carpet! I won't mention any names, but suffice it to say...it happens. There's a reason it is sometimes referred to as a "stability" ball. tee hee. Muscle Group Worked: Abs, all of 'em. Starting Position: Sit on top of an exercise ball with your feet placed firmly on the floor in front of the cable machine. Use a rope attachment set at about knee height. Roll the bottom half of your glutes off the ball by sliding forward. Grasp the rope and bring it to just past your ears and hold it stationary in this position throughout the move. Execution: Exhale while slowly crunching your upper body forward and roll your shoulders towards your hips. Squeeze at the top! Then lower back to the starting position and repeat for desired amount of reps. TIPS: Keep arms barely in your peripheral vision throughout. This is a subtle move. You only need to curl about 3 or 4 inches to really feel this. Keep the hips low enough to keep your balance yet high enough to isolate your abs. Don't forget to EXHALE! Okay, peeps! This is the inspirational part of the newsletter known as the "Ponder Pond" where you're welcome to take a swim in the sweet waters of inspiration that can only come from things that make you go, "Wow!" This week's inspiration is a video link that will hopefully make you realize the power we all have to create our lives however we choose. Do yourself a favor and sit back and enjoy this thought-provoking video. Well, that's about it for this month! Until the next issue, may the wind be at your back and improved health and vitality your new reality! And don't forget to tell everybody about. Straightforwardfitness.com where they can get all the free fitness info their heart desires and sign up for this newsletter while they are there.